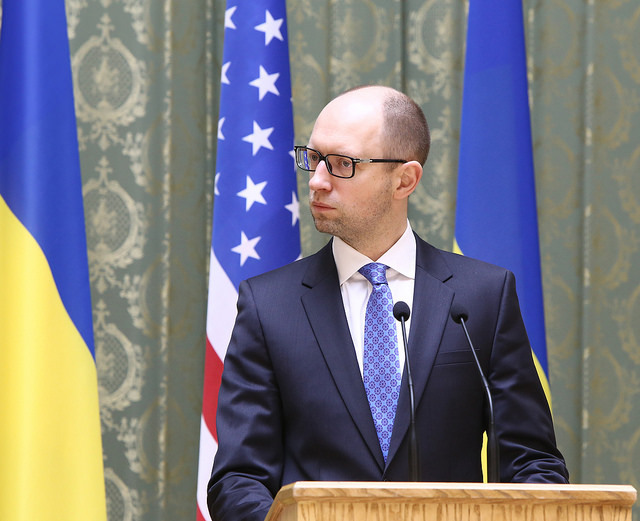 Ukrainian Prime Minister Arseny Yatsenyuk said today (29 August) that his government will introduce a proposal in Parliament to change the non-aligned status of the country, and to request membership of the North Atlantic Treaty Organisation (NATO). The proposal is also aimed at banning Ukraine’s membership in other political organisations than the European Union, putting an end to speculation about joining the Russia-led Customs Union, and the Eurasian Union, Russian President’s Vladimir Putin’s geopolitical project. According to the Ukrainian press, the Parliament would debate the government’s proposal on 2 September. The reaction of NATO Secretary General Anders Fogh Rasmussen to Yatsenyuk’s statement was fast. He said that he respected Ukraine’s decision and that each country had the right to take decisions regarding its security policies. If Ukraine fulfills the criteria for becoming a NATO member, and if it abolishes its non-aligned status, it has the chance to join the alliance, he said. Ukraine’s non-aligned status has long been considered as the best option, given the security concerns of Russia. But the escalating situation in Ukraine appears to be a game changer. In Ukraine itself, the number of supporters of NATO membership has dramatically increased over recent months and in July, for the first time, has exceeded the number of those opposed to joining the pact. Rasmussen also said that Russian forces were engaged in direct military operations inside Ukraine in a blatant violation of Ukraine’s sovereignty and territorial integrity. “Despite Moscow’s hollow denials, it is now clear that Russian troops and equipment have illegally crossed the border into eastern and southeastern Ukraine,” Rasmussen told reporters after NATO ambassadors held an emergency meeting with their Ukrainian counterpart at Kyiv’s request. “This is not an isolated action, but part of a dangerous pattern over many months to destabilise Ukraine as a sovereign nation,” he added, as quoted by Reuters. “Russian forces are engaged in direct military operations inside Ukraine […] Russia continues to maintain thousands of combat-ready troops close to Ukraine’s borders. This is a blatant violation of Ukraine’s sovereignty and territorial integrity. It defies all diplomatic efforts for a peaceful solution,” he said. EU diplomats said today that they needed “clear-cut confirmation what the actual situation in Ukraine is”, referring to the claims that Russia had started an outright invasion, before EU leaders could decide to task the Commission to propose further sanctions. The ball is largely in the camp of Catherine Ashton’s External Action Service, which should provide such confirmation. According to information obtained by EURACTIV, a presentation by Ashton’s number two, French diplomat Pierre Vimont, to EU ambassadors yesterday, was “inconclusive”. The Commission should produce an assessment of the impact EU sanctions have had on Russia and on the member countries, before further sanctions are decided, some EU countries claim. Asked when the Commission will produce such an assessment, Ashton’s spokesperson Maja Kocijancic said the assessment was “ongoing”. Diplomats also said that the informal ‘Gymnich-type’ meeting of EU foreign ministers in Milan, which takes place today, could clarify the situation around Ukraine. Leviy bereg, Ukraine: ?????? ?????? ? ???? ???????????? ?? ?????? ???????????? ??????? Leviy bereg, Ukraine: ????????? : ??????? ????? ???? ????? ?????? ???? Zerkalo nedeli: ?????? ???? ???????? ??????? ???????? ? ??????? ? ??????? Pravda, Ukraine: ?????? ?????????? ???????? ??????????? ?????? ??????? Do that Yatsenyuk and Russia will invade full force. Why would Russia invade full force? Ukraine is a sovereign, independent state. The Ukrainians should decide on their future, not Russia. Yet, here we see the results of Putin’s imperialist ambitions: in seeking to control Ukraine all he has achieved is to drive Ukraine into Nato’s arms! Well done Putin, you have managed to reactivate Nato, have eastern European countries seek extra Nato protection, have non-aligned countries such as Sweden and Finland request closer cooperation with Nato and made the Ukrainians seriously consider joining Nato! Yes Eurochild, is so true but Ukraines prior destablizied condition created by Russian (Putins) implants kept Ukraine from joining NATO long ago. Besides signing accords with the Euro Union they should hav at same time applied earlier membership to better be able to dfend their country from Putins tactics that has caused a lot of lost lives. If one spends time in both countries one can see and feel that the average citizen is warm hearted and peace seeking , its the leaderships that distort the political truths. Putin won’t be happy till he is able to absorb and take back all of Ukraine eveident by his cowardly tactics to date. Is nothing more cowardly than picking on a weaker opponent physically not to mention causing loss of innocent lives to pursue some fanatical desire to dominate the world. Russia talks about defending itself but who in their right mind would even think of confronting offensively Russia??? Recent truths that have existed for a long time is that Russian leadership is living back in the 40’s and 50’s trying to bring back the days of the Soviet Union but how remarkable is this memory when Russia collapsed in 1990 due to their thinking & beliefs, now instead of learning from their mistakes they resort to continuing their old dialogues that don’t fit with todays time. First off Jay, the Ukraine region was annexed by Russian Leadership in 1954. Ukrainian & Russians have lived together since for some 60 years with Ukrainine being implanted with Putins Puppets . In the most recent past the Ukrainians never had their own representation but led by the nose with corrupt implants, Yanukovitch being the most recent but typical of the others also. Yanukovitch at behest of his people was going to sign the European Union accord until Putin applied his cohersion with 15 billion dollar bribe so that Yank & his kronie culprets could pocket even more graft. The main reason Putin has been able to do what he has is because Ukraine was weakened by the prior puppets, drained of assets and military might making them vulnerable to take-over by Putins desire to reabsorb the Ukraine. How noble is it to ignore another countrys right to independence ?? If those in Ukraine want to be controlled by Russia then they should pack-up & move to within Russian boundries not resot to Putins sabotage tactics to encourage destabilization and losss of innocent lives. If Ukraine was a member of NATO I doubt Putin would be getting away with all he has. Furthermore trying to be diplomatic with mercenaries is stupid for war mongors thrive on absolent acts. Its cowardly to hide behind obvious subversive acts claiming the separtists are independent of Putins support just like they were in Crimea right?? Putin has been walking the fine line ever since his first ploys using Russias resources to intimidate quiesece of opinion figuring knowone would challenge him for economic reasons but this is an ideological conflict and Putins strength lies in using force not diplomacy to take back regions that do not belong to him. Sould the USA be able to enter in Ukraines defense I doubt Putin would be able to continue. Please spare me your BS, my wife is Ukrainian, I know Ukraine history front and back, I also know how the oligarchs manipulate the people, both Russian and Ukrainian. Most Americans know WHO NATO is and it’s NOT European! I do not believe Putin and Russia want to take Ukraine as a whole , or in part . Russia wants Ukraine to be a free state as before . The east has major industries that are of special interest to Russia . Russia does not want NATO in Ukraine , US spies on her doorstep , anti missile defences right on her border . The US would not like that or any other country . We forget the USSR sending nuclear missiles to Cuba and president Kennedy’s firm response . That is what Putin is doing , defending what he considers Russian ally territory . If Putin were to get the idea that NATO might involve itself in Ukraine , I think Russia would simply take all of Ukraine and sort things out to their liking . I do not think NATO will want to be involved , because that would involve escalating the war to a disproportionate level , effectively WWIII . That could cause Ukraine to be totally destroyed and further involve nuclear weapons that could even reach the US . The present sanction against Russia and vice versa are crippling the EU and could even bring the collapse of the Euro . Perhaps the latter is part of the US strategy . Ukraine has never been a completely free state being led by Putins implanted parliamentary figures within Ukraines infrastructure doing the bidding for whatever Russia accepts. Everyone keeps ignoring the fact that this eastern region was annexed to Ukraine by the Russian leadership back in 1954 but has been content to abide by such transaction because Russia still had its fingers on the controls of the Sebastopol seaport , implanted puppets in Donestk & Lugansk with its kronies passing and not passing legislation that favors Russias containment of Ukraines aspiration to be a separate entity irregardless of how many Russians live in Ukraine. Russians according to their own citizens boast their non-abiding of laws & regulations striving to bring back the Soviet Union era that collapsed from Russian leadership and the USA aided Russia by sending products of support during those rough times . President Kennedy objected to Cuba allowing the implantation of missiles because Cuba itself exists in a similar dictatorship run regime thwarting civilian freedoms using force not diplomacy to resolve disagreements. Essentially Russia was placing missles into fanatic hands where I don’t think Ukraine can be called fanatical to ever think of attacking Russia. Granted, the USA is the strongest NATO member next to Germany & the UK but nothing can be inacted unless there is a consensus of agreement. Continually trying to use the USA as a scapegoat to disquise the aggressive attempts of control by force is foolish. Why then has Russia so often objected to first Ukraine joining the European Union?? because it prefers again to control its own existence by countering the established Union with its own created Eurasion Union but is not as potent without owning Ukraine territory. There has always existed a desire to control nuclear capabilities especially directed to military implications is why treaties were set up to restrict proliferation but Russia goes ahead and builds reactors in Iran , another fanatical terriorist Country . I don’t think a nuclear war is possible to those that value life for if it was started it would not take out just a few countries but the whole world. Odd how Putin uses this scare tactic in defense of his aggressive nature?? That’s Bully talk “Don’t Mess With Us”???? but he thinks nothing of messing with others. This whole situation is so foolish for it would only take fair consideration of all parties to negotiate fair resolutions diplomatically rather than using force to destabilize another country. Its such a shame because the Russian people are very hard working, creative and intelligent and could be respected for their positive achievements & mutual cooperation making everything more peaceful rather than to crave superiority based militarily on some outdated ideological concept that failed in the 1990’s led then by dictators. Comments like those of skyscraper007 are buried in the past, I keep wondering when someone will bring up the Mongol invasion. I dont understand what is going in Putin’s mind. What does exactly he wants? He is creating chaos for no good reason. The USA, EU are not creating chaos? Putin wants the same as the US, EU. Everybody wants to rule the world: Of the corporation, by the corporation, for the corporation. Everything else is a smokescreen, only the tactics differ and the technology changes. I agree Jay, The USA, EU are not creating chaos?Putin just wanted to rule the world and I think he is going to succeed.